American engineer. Part of the Atlas management team. Born: 1917. Died: 1999-01-01. Birth Place: Highwood, Montana. Bill Patterson, son of a threshing tractor salesman, spent high school in California. He graduated from Whittier College, and served in the US Army during World War II as an electronics and radar specialist. After the war, he was hired by Vultee and worked on the MX-774 long-range missile program. He was part of the team that kept what would become the Atlas rocket alive within the company in the face of government indifference. 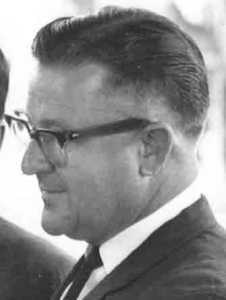 After the program went ahead in 1953, he served in roles of increasing responsibility as engineer, marketer, Project Engineer, Deputy to the President of Convair, and finally Vice President for Advanced Systems. In the latter roles he developed a web of important government contacts. He left Convair in 1965, joining General Electric Philadelphia as an Engineering Manager for space vehicles. From 1975 until his retirement he worked for GE in Washington, DC, as a government liaison officer. Country: USA. Agency: Convair. Bibliography: 4460, 4475, 5873. 1999 January 1 - . Death of William Howell Patterson. - . Related Persons: Patterson. American engineer. Part of the Atlas management team..